Be the first to share your favorite memory, photo or story of Trisha . This memorial page is dedicated for family, friends and future generations to celebrate the life of their loved one. 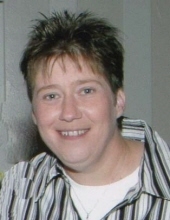 Trisha JaLynn Stevens, age 48, died Friday, October 5, 2018. She was born June 27, 1970 in Oklahoma City to Allen and Carol (Morrison) Stevens. She was a 1988 graduate of Mustang High School and a member of Chisholm Heights Baptist Church. Trisha worked for Braums and she was an attendant at the Will Rogers Airport. She loved to cook, rope horses and take care of stray cats, her favorite was “Booger”. She is survived by her parents Allen and Carol, brother Clint Stevens, special cousins Rhaiden and Ty and many aunts, uncles, cousins and dear friends. Funeral Services will be 10:00am Friday, October 12, 2018 at Chisholm Heights Baptist Church, Mustang, OK with interment to follow in the Mustang Cemetery, Mustang, Oklahoma. To send flowers or a remembrance gift to the family of Trisha JaLynn Stevens, please visit our Tribute Store. "Email Address" would like to share the life celebration of Trisha JaLynn Stevens. Click on the "link" to go to share a favorite memory or leave a condolence message for the family.